The Iberian Horse is the most ancient riding horse known to man. The Spanish and Portuguese horse originates from the Iberian Peninsula. 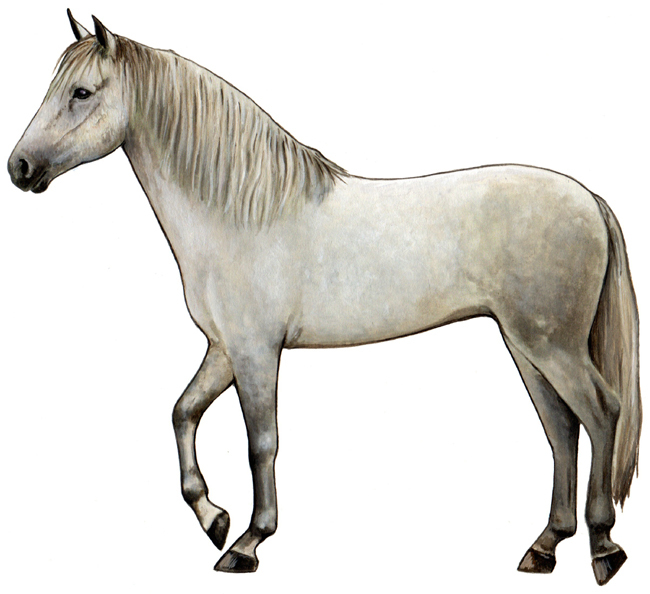 The Andalusians (Spanish) and the Lusitano (Portuguese) are different branches of the same breed. The University of Kentucky blood testing proves that there is no difference in genetic markers or variability. The Andalusian horse or Spanish horse is one of the purest breeds of horses in the world today. It is also known as PRE (Pura Raza Espa�ola, en. Pure Spanish race) in most countries because of the work done by the Spanish studbook in promoting the pure bred horses around the world. It is one of the two sub-breeds of the Iberian horses, and extremely similar to the closely related Lusitano breed. Andalusians have been used for all manner of riding horses, and were the preferred mount of kings over many centuries. They excel in high school dressage and are used in cattle work and bullfighting in their native Spain. They are highly intelligent and learn very quickly. Part bred Andalusians are popular as sport horses in many countries. They also excel at classical dressage and are used for show jumping and other equestrian activities. Archaeological evidence in the Iberian Peninsula, modern day Spain and Portugal, indicates that the origins of the Iberian Horse date back to at least 25,000 B.C. in the form of its primitive ancestor, the Sorraia. Cave paintings in the Iberian Peninsula dated from around 20,000 BC depict portraits of horses and activities related to a horse culture. Later, the use of heavy plate armor required stronger breeds. In the 15th century, the invention of firearms called for a lighter, and more agile cavalry horse, and the Andalusian's popularity rose again. During the Renaissance, the great Classical Riding Academies took an interest in the breed. Because of the Andalusian's agility and natural balance, it excelled in the High School Dressage performed in many courts of the day. The Andalusian went on to develop many other breeds suitable for High School Dressage, including the Lipizzan, Alter Real, Lusitano, Kladruber, and many European warm bloods of today. During the 19th century, the use of the Andalusian declined. However, Carthusian monks continued to breed the horse, and preserved the purity. Today, the Spanish government promotes the Andalusian, and the breed is gaining in popularity for High School Dressage demonstrations. They are also popular for bullfighting, and have recently been used for dressage, show jumping, driving and endurance, although Thoroughbred blood is often added to give the breed more scope.